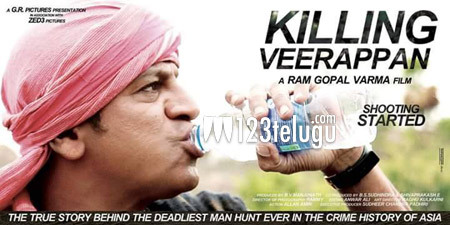 Ram Gopal Varma’s ambitious multilingual film based on the life of notorious sandalwood smuggler Veerappan, Killing Veerappan, has hit a major roadblock just a week before its release. The film, which is made in Telugu, Kannada, Tamil and Hindi, is slated for a wide release on the 4th of December. Now, Veerappan’s wife Muthulakshmi demanded a ban on the film alleging that RGV took her permission to make the film only in Hindi and not in other languages. Alleging that RGV portrayed Veerappan in a negative light in the trailer, Muthulakshmi said that the makers must show the complete film to her and should not release the film without her consent. Muthilakshmi also objected to the film’s title and demanded a change of title since any such wrong portrayal of her husband would show a negative impact on her family members. The film features Kannada stars Shivarajkumar, Parul Yadav, Yagna Shetty and debutant Sandeep Bharadwaj.